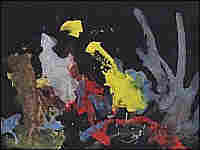 No Chump Change for Chimp Art Three paintings by a chimpanzee named Congo sell at auction for about $25,000. Buyer Howard Hong of California explains why he paid more than 10 times what Congo's work was expected to fetch. Three paintings by a chimpanzee named Congo sold at auction in London Monday for about $25,000 -- after having been expected to fetch less than $2,000. The winning bidder was Howard Hong of Pasadena, Calif. He speaks with NPR's Robert Siegel about his animal-art purchase. Congo died 40 years ago of tuberculosis. In life, he was a frequent and popular guest on Zootime, a British television show hosted by animal behaviorist Desmond Morris. Congo left behind some 400 drawings and paintings. 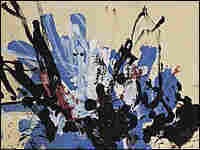 In 1957, Morris curated an exhibit in London of chimpanzee art, which included a number of works by Congo. Morris was interested in exploring chimps' ability to create order and symmetry and in our human impulse toward creativity. It's an idea that also intrigues Hong. "Who is to say that humans have a monopoly on the ability to concept abstractly?" Hong says. "I think many pet owners would disagree with that statement."